We're two weeks into the school year at my house and I'm still working hard to keep on top of things. This year all three kids are in school: 6th, 3rd, and Kindergarten. We've got a great routine down that we started about two years ago. We've tweaked the times and changed the songs, but the kids are still trained to know where to be by which song is playing on the iPod. Last year we also added some cubbies to the living room so everyone would have a place to put their stuff. That system has worked really well aside from things spilling out on occasion. We moved the lunch boxes to some hooks on the side of the refrigerator to make some more room and to encourage everyone to clean out the lunch bags after school rather than waiting until Monday morning to find the leftover sandwich. This year I am building on the systems we already have in place and tweaking a few things. First, I bought a metal file tray. I put it on top of the cubbies and now all papers go in there after school. Last year the kids drove me crazy shoving papers in my face while I was trying to make dinner. This year, I refuse to touch anything!! They put their papers in the tray and I sign them and put things where they go after they go to bed. I also created a binder system for all the papers that need to be kept. This binder has tabs for church/Sunday School activities, each child, soccer, violin, dance, and their after-school program. Confession time: I had intended to use this binder last year. I bought the supplies for it and set it on the table in the kitchen. It stayed there for a full year until I got it out and promised myself to use it this year! I didn't even bother to try and make it pretty. I just want it to be useful! In order for it to be useful, it has to be easy to use. In that vein, I put a 3-hole punch right inside it so I have no excuse for not putting papers in right away. I also made a cute pencil pouch to keep inside it, so that pens, pencils, and the elusive last minute lunch money would never been far away. I can't organize a binder for you, but I can show you how to make this simple and easy pencil pouch to use in it. Your kids can make them to for their own binders. 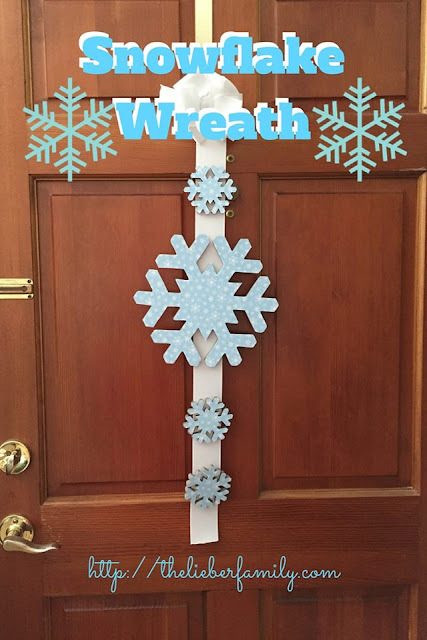 You could even make one for each kid's tab so that you can keep little odds and ends separated. You will need a zip top gallon storage bag, fun duct tape, scissors, and a three hole punch. Using the tape, cover the bag all the way up to just below the zipper part. Make sure you fold a piece over the bottom seam to reinforce it. Once you have covered the whole bag, trim the edges (if needed) and punch holes in it at the bottom seam. Now you can put it in your binder and use it to hold your stuff! If the bag is to big and sticks out of your binder, you can actually cut off the appropriate amount from the bottom and then tape it shut securely. The duct tape will not only keep the bag from ripping or tearing throughout the year, but it will make it look pretty! Need some more Back-to-School tips? The Blog with Friends bloggers are here to help! Karen at Baking in a Tornado made some Kit Kat Brownie Bars you might like to add as a new back to school tradition. Eileen at Eileen's Perpetually Busy shows us a great way to show off your summer vacation memories. Lydia at Cluttered Genius has a great list of online teaching tools from an online teacher. Stacy at Stacy Sews and Schools made a cozy cover for a nap mat. Joy of Evil Joy Speaks shows how to refinish a table as a place to do homework. Melissa of Home on Deranged put together a list of apps to use and apps to avoid this school year. Robin at Someone Else's Genius created this back to school wreath to display on your front door. 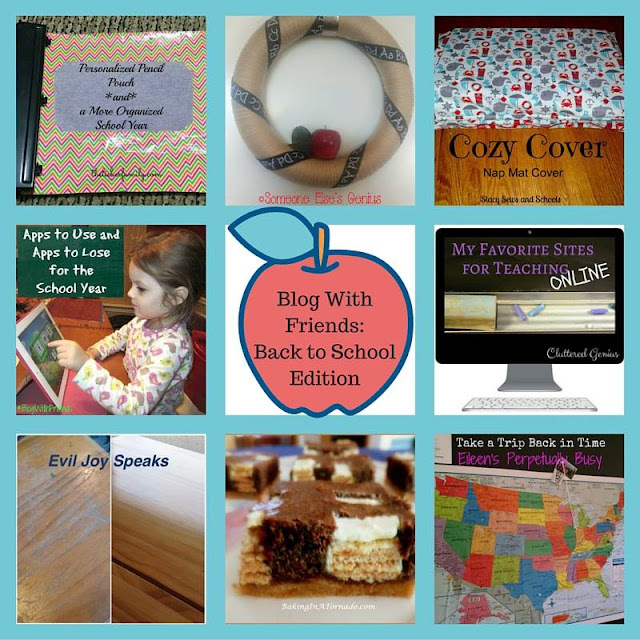 Make sure to stop by and visit all these great back to school ideas!